Anyway, traditionally, you cook this with a bouquet garni — a bundle of herbs usually tied together with a string or placed inside a small sachet and is cooked with the other ingredients but is removed before the food is served. The herbs may vary but the usual ones are thyme, bay leaves and parsley. I have tried both the fresh bouquet garni and the dried ones in the sachet. Feel free to use whichever is readily available to you. You may add extra veggies such as carrots or potatoes, if you feel like it. I am quite happy with just the mushrooms and onions as we have a side of veggies to go with this dish all the time anyway but I leave that decision to you. Just add the veggies when you add the mushrooms so they don’t mush up. Please enjoy this superb dish, it’s truly fabulously French and so fantastically delicious, too! Place the stewing meat in a large bowl. Pour in the red wine and the olive oil. Stir and then leave to marinate in the refrigerator for at least 2 hours. 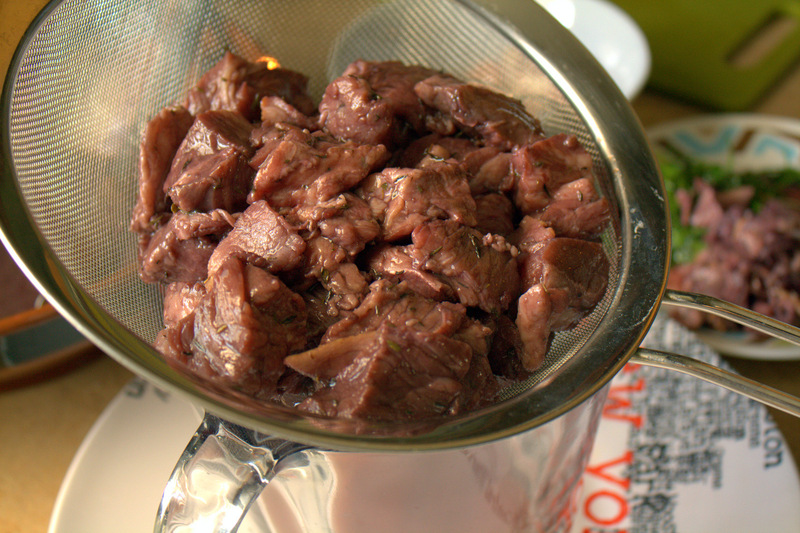 Remove the beef from the bowl and drain well. Set aside the marinade for later use. In a flame or heat proof casserole or Dutch oven, melt the butter. Saute the bacon and onions gently for about 5 minutes. Using kitchen tongs, transfer the bacon and onions to a bowl. Allow to cool. I place the bacon and onions in the fridge after they have cooled down. In the fat that’s left on the pan, brown the beef. Stir in the flour and cook for about a minute. Pour in the marinade and bring to a boil. Add in the garlic and bouquet garni. Season with salt and pepper. When I used the dried bouquet garni I added 2 extra bay leaves, just because I had some on hand but this is optional. Here’s another photo this time with the fresh bouquet garni. Cover then transfer to the oven and cook for at least 1 hour (up to 1 1/2 hours). Remove the pan from the oven. 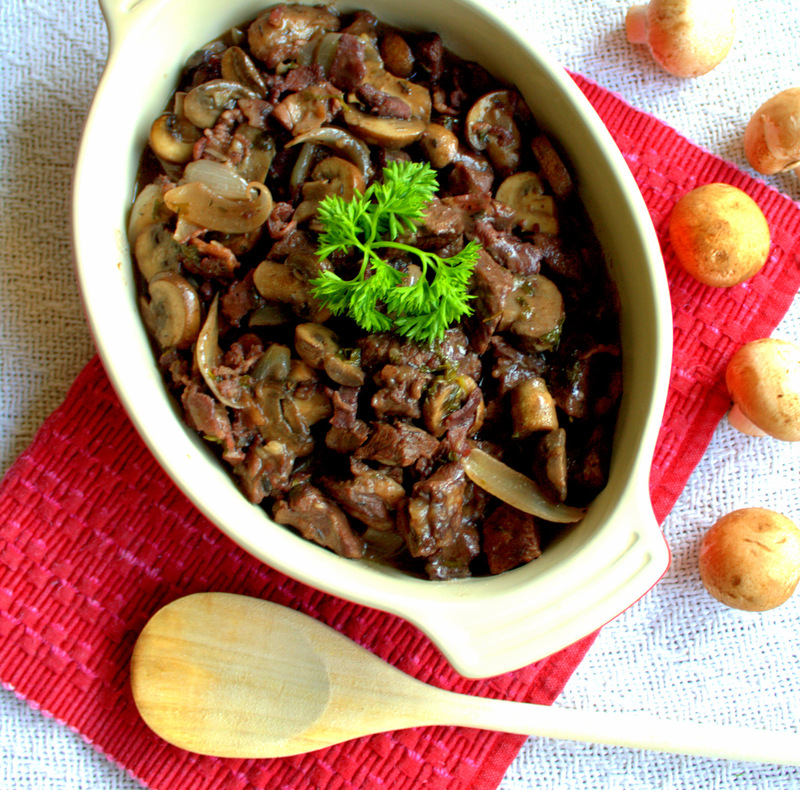 Stir in the bacon and onions together with the mushrooms. Cook for another 30-45 minutes or until the beef is fork tender. Remove the bouquet garni. If you wish to print the recipe, there is a print-friendly icon at the end of the post. Click on the “remove images box” for convenient printing. If you like what you see and would like to receive new recipe updates we’d love you to subscribe to our posts and join our site. Also do like us in Facebook so you can get the latest updates and so much more. Thanks for visiting and happy browsing! Mmm, this dish looks so yummy! Thanks for sharing. Looks fantastic…and I can't pronounce it either! I'll have to try this when the weather cools a bit. Haha, yes name is tricky to pronounce:)) but nothing tricky eating this yummy meal. Looks wonderful and sounds like something i would love to dip my bread in and just enjoy! Thank you for sharing and have a wonderful weekend, Abby! Thanks Sandra! I think you're right, it's wonderful to eat with some yummy crusty bread! This sounds wonderful, but I can't have dry red wines (they give me migraines). Do you have any suggestions as to what I could substitute? Thanks. Your recipes have all sounded fantastic! Hi Anne. Sorry for the late response. Somebody once suggested using broth (beef in this case). It won't be the same taste and perhaps not as flavorful as the one with wine but may be worth a try. I don't drink so I don't have a particular brand or type of red in mind. I just use a dry red wine that's reasonably priced (not too cheap or it's no good!). Perhaps you can check some of these – Zinfandel, Merlot, Cabernet Sauvignon to try. Thank you. We love this dish a lot and hope you can try it, too. Thanks for stopping by. G'day Abby! looks ABSOLUTELY wonderful and have always wanted to make! WISH I could come through the screen and try now…have pinned and shared the love today! Thank you so much Joanne. Please enjoy and hope you can make this soon. Glad you stopped by.